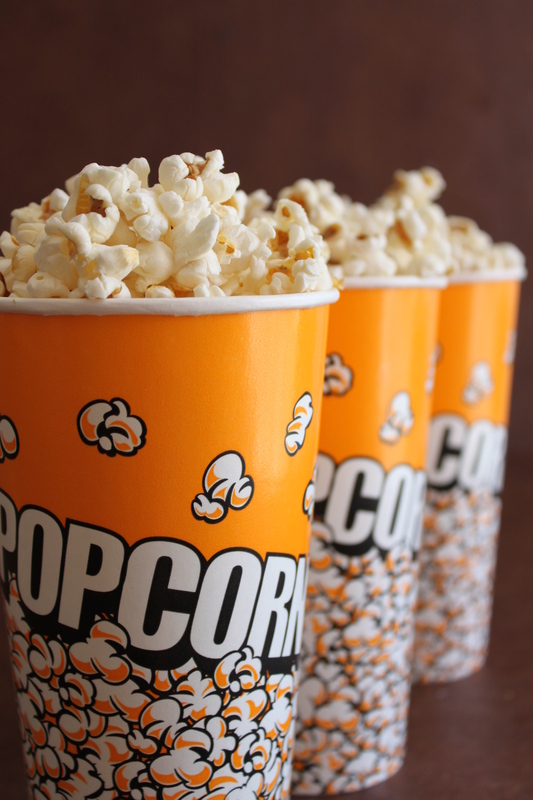 I can’t even begin to describe how much I love popcorn. I can eat it forever. 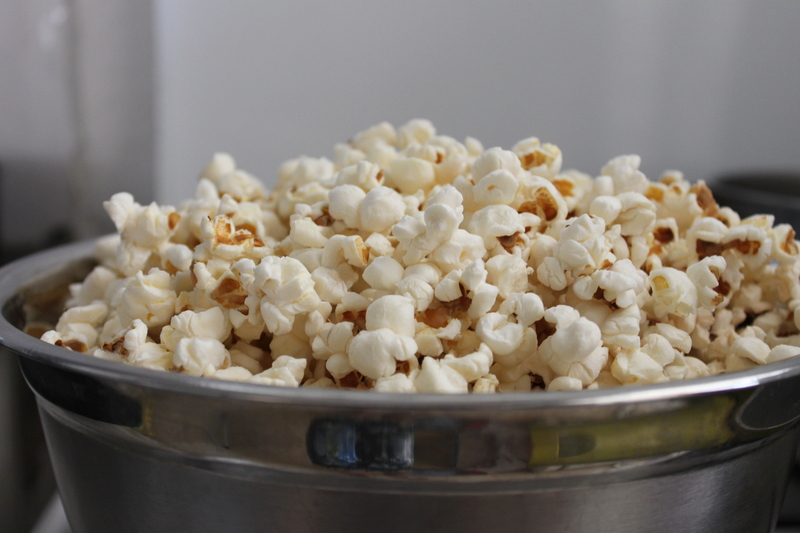 It’s fast and easy to make, it’s the perfect cure for the all those times you remember you are “hungry” because you have to do homework or any other thing you want to procrastinate on…** And besides, eating popcorn is like eating a cloud. A salty, softly-crunching cloud. 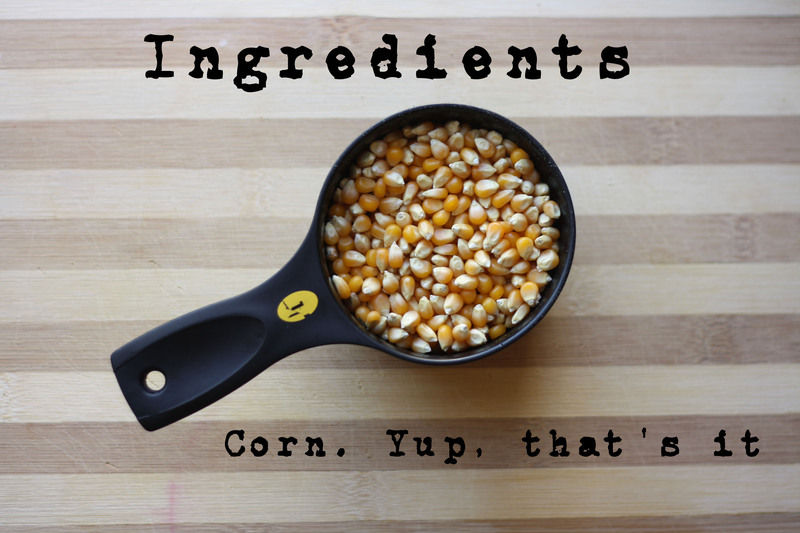 And the possibilities with it are virtually endless – plain, salted, kettle-corn style, colored with a whole rainbow of spices, salted and covered in chocolate… You get the picture. Just to demonstrate how much I adore popcorn, I took a picture of the popcorn bag (sack) I have. Note the comparison to your standard, no. 2 yellow pencil. Yeah – HUGE. And that’s without counting the two spare kilos I have in the back. As a Computer Science major and a lover of all things math, I take a somewhat scientific approach to popcorn making. 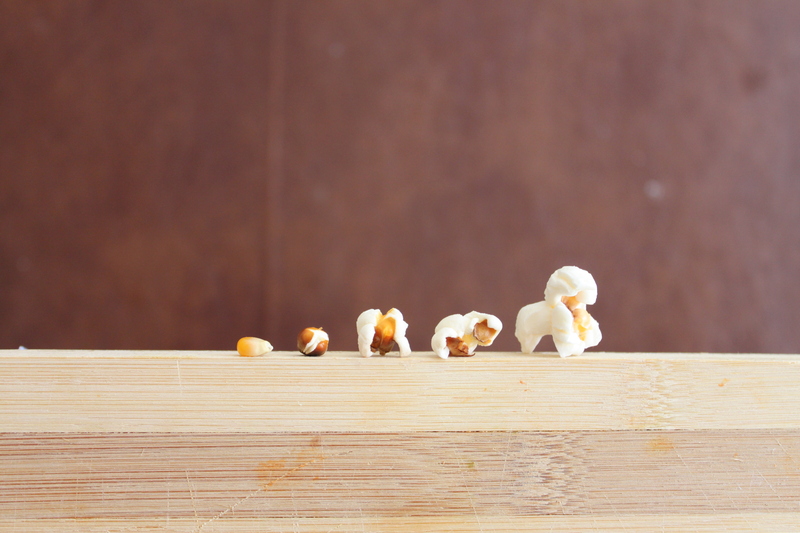 The goal is clear: The perfect pop is one that yields the most popped kernels, the least unpopped kernels, and the least burnt popcorn pieces. That’s all there is to it. Most popped, least unpopped, least burnt. Easy enough, right? WELL. Turns out, it is not so easy. I mean, it isn’t terribly difficult, but it requires a bit more calculation than simply throwing a bunch of corn kernels in a pot and hoping for the best. 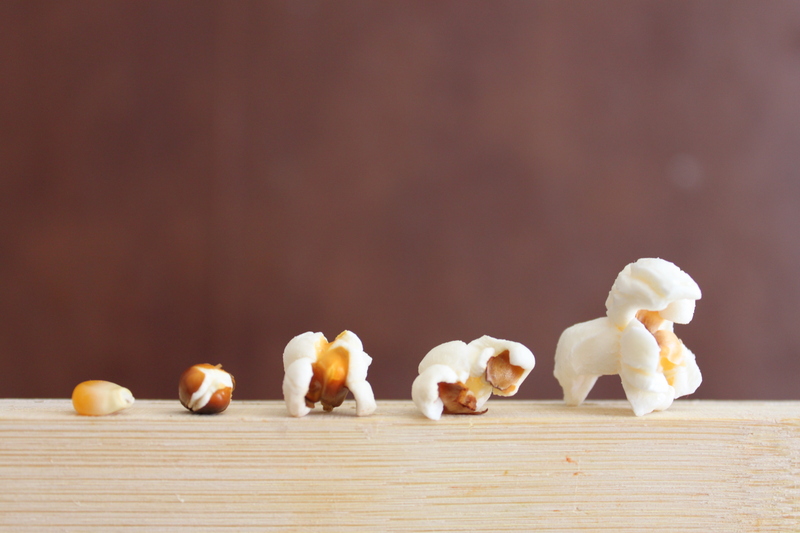 But, worry not… I wouldn’t just talk all this popcorn talk without walking the popcorn walk – with a fully photographed tutorial, of course. My best ever was 1071 out of 1099 popped – zero burnt. Yes, if you are asking yourself – I did count the amount of kernels in one cup. Just to give you real statistics here. Is it a ridiculously huge number to count? Yes. Did I feel kinda pathetic while counting it? Absolutely not! It is what every good blogger would do for her readers. 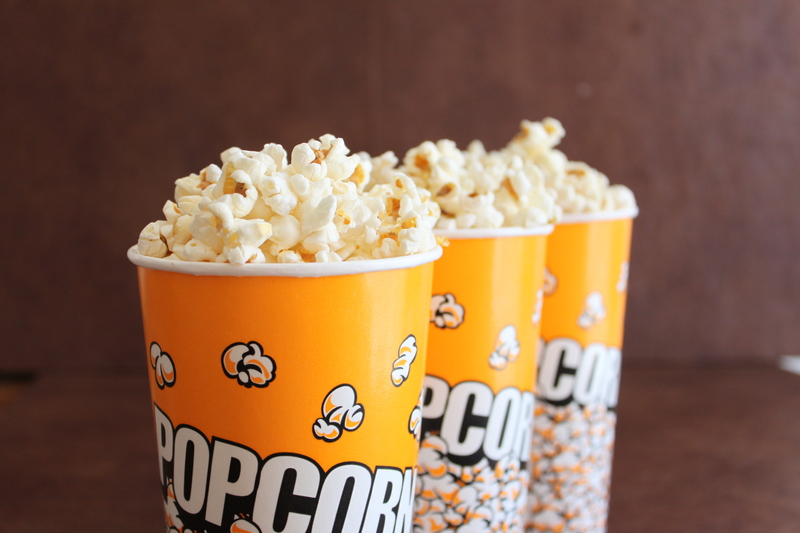 If you follow these directions, I guarantee you will improve your popcorn stats significantly! 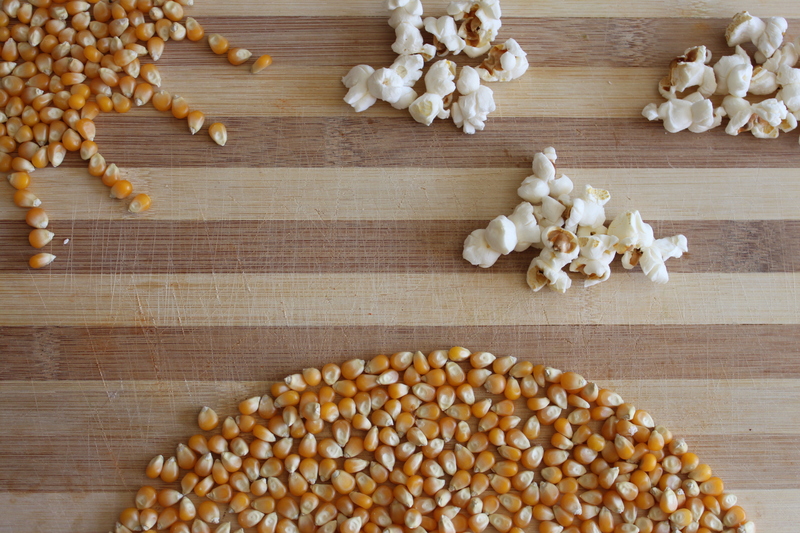 What’s your favorite way to eat popcorn? Do you have a quick go-to snack that you consume (by the pound) during stressful times when you hole up at home and all the “real” food runs out? * Disclaimer: I am in no way endorsing procrastination. Nor do I think a bowl of popcorn is an appropriate “meal”, especially for students whose brain-power depends so much upon the food they fuel their bodies with. 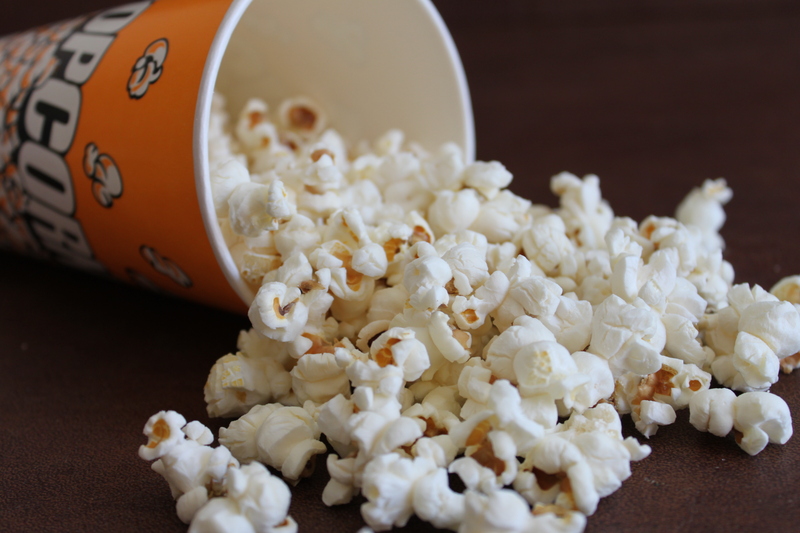 That said, I find myself turning to popcorn so often as exams draw near, programming tasks pile up, and all students find themselves holed up in their apartments/dorms doing nothing but study, that it would just be selfish of me not to share the ways of the perfect pop. 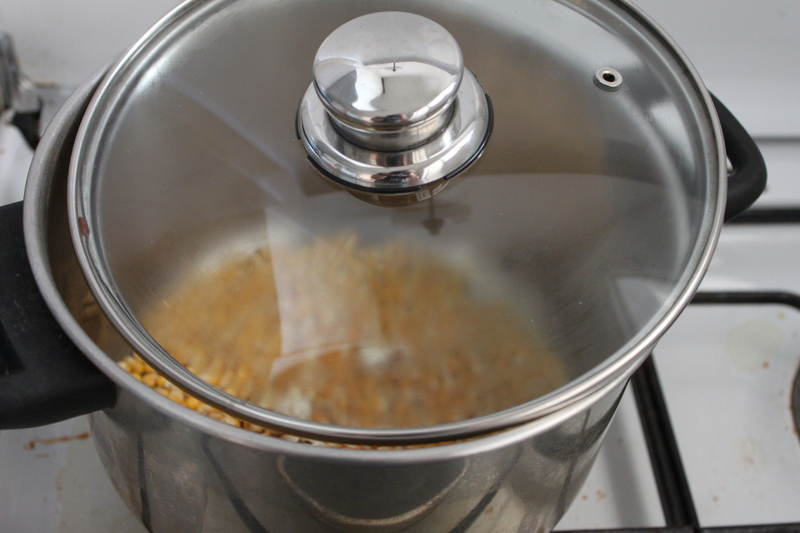 The first thing you need to make perfect popcorn is, of course, the right pot for the job. 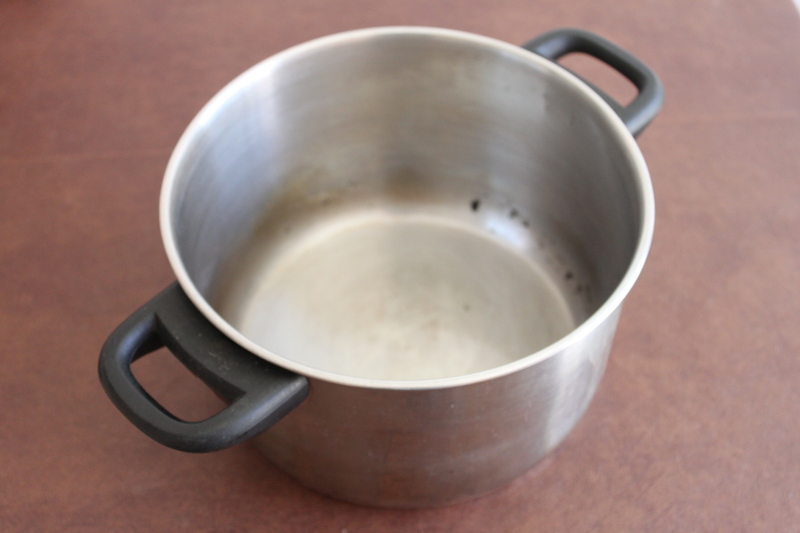 It’s best to choose a pop pot that has a completely flat bottom – just an old-fashioned, no-gimmick pot – preferably not the non-stick kind. This is important because in order for the popcorn to be crunchy and not burn, you need a thin, even layer of oil on the bottom. If the bottom isn’t flat, not only will it cause uneven “depths” of oil, but it will also cause you to use much more oil than necessary. Boo. Now, there will be failures. You cannot expect to succeed every single time. This is why, in my opinion, it’s best to designate a pot specifically for popcorn making. It can obviously be used for other things, but the point is to have ONE pot in the house that you use for popcorn – one, and no more. That way, when inevitably some layers of burnt oil start building up on the sides of that pot, you only have one pot to clean (and it won’t even be a fancy one). Now that you have picked your pot, it’s time to add the oil. You don’t need a lot, but you do want to make sure there is enough. Too little oil and you’ve got yourself a bunch of burnt popcorn. Not very good for your stats. So what’s the right amount? Well, really it depends on the pot. Put in enough oil to cover the bottom in one thin, even layer. And no, don’t use your hands (or anything else) to spread it around the bottom – that will be too thin a layer. The oil needs to spread “naturally” – the only thing you are allowed to do to help it spread is to gently tilt the pot around. 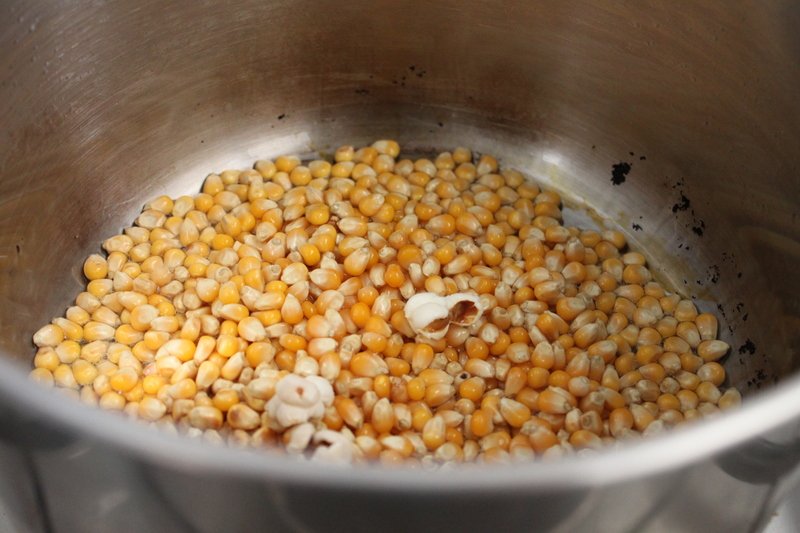 Place three kernels on the bottom of the pot, and turn on the heat to medium-low. And now, we wait for the magic to happen. 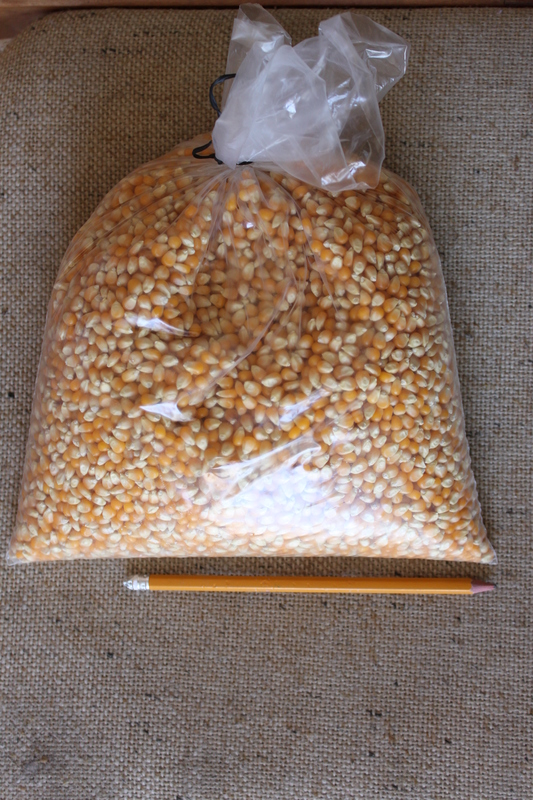 More specifically, we wait for the three kernels to have popped before adding the rest of the corn kernels. The reason for this is that this way, the oil can heat up to the right temperature faster (having a whole cup of kernels sitting in it slows it down, which means some will overheat and burn during the process), and at the same time those three kernels keep us from ever exceeding the right temperature (once they pop, we know we’re there). 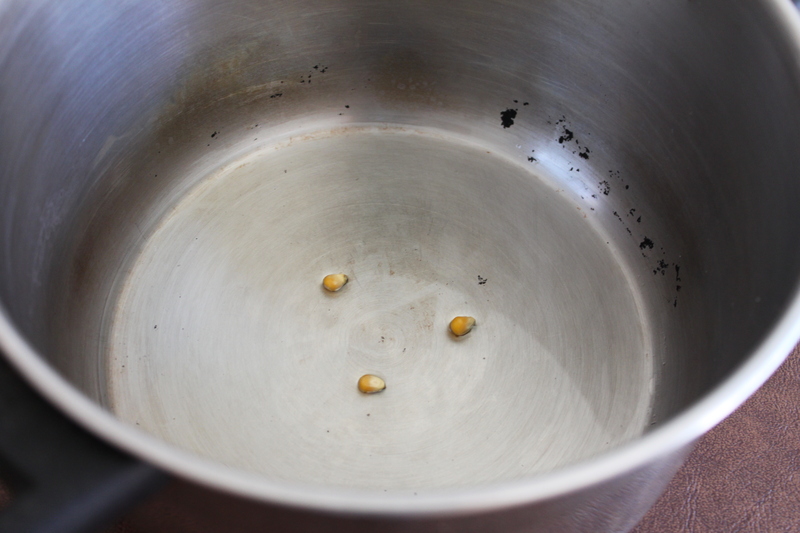 Immediately after all three kernels have popped, pour in the rest of the corn (you can see I was a little late in doing it for the sake of taking a picture – the oil is already starting to brown at the side of the pot). Swirl it around in the pot so that all the kernels have some oil on them, and then shake it out so that they are in as even a layer as they can be on the bottom of the pot. Half-cover the pot (just enough so that kernels don’t pop out), and wait until it starts popping. The popping should go from sparse to more frequent to INSANE and then back down again. Shake the pot a couple of times during the INSANE period so that the unpopped kernels fall to the bottom and have a chance to pop. Eventually, the popping will subside enough and that will mean it is time to take the pot off the heat. But when is enough? This is where it gets difficult. You want to get as many popped as possible, but you don’t want to get too greedy or else they will start burning. 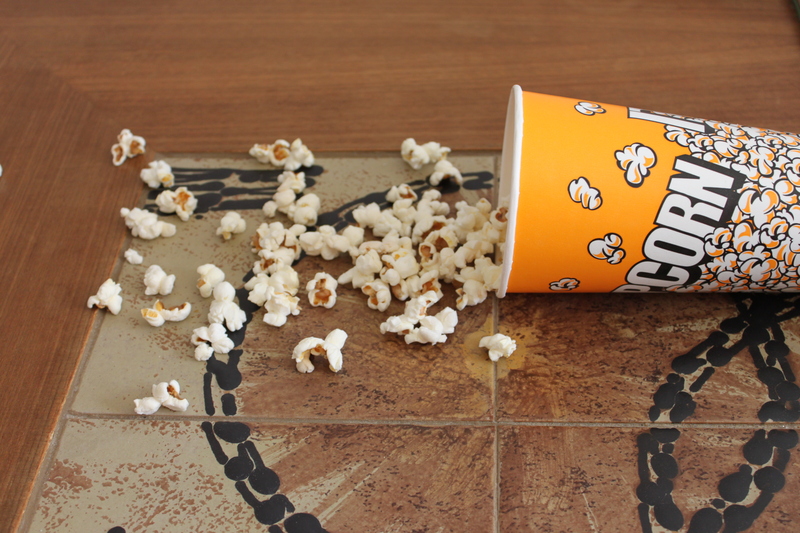 The recommended time-frame to stop popping is just as the instructions on microwave-popcorn bags suggest – listen for when the popping goes down to 2-3 seconds between each pop. Leave the lid on the pot (which is now off the heat) until the popping stops completely. 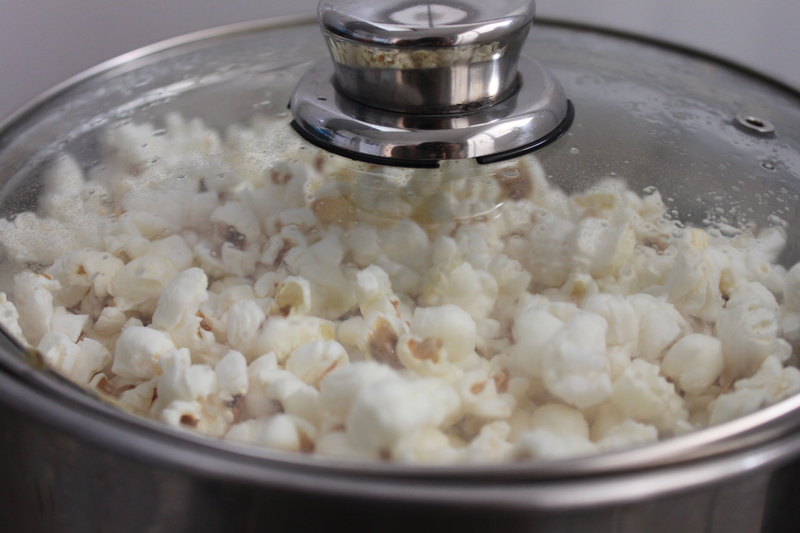 If you feel like you got a little greedy in the previous step and keeping the pot closed any longer will cause the popcorn to burn, remove the lid and then wait for it to stop popping. 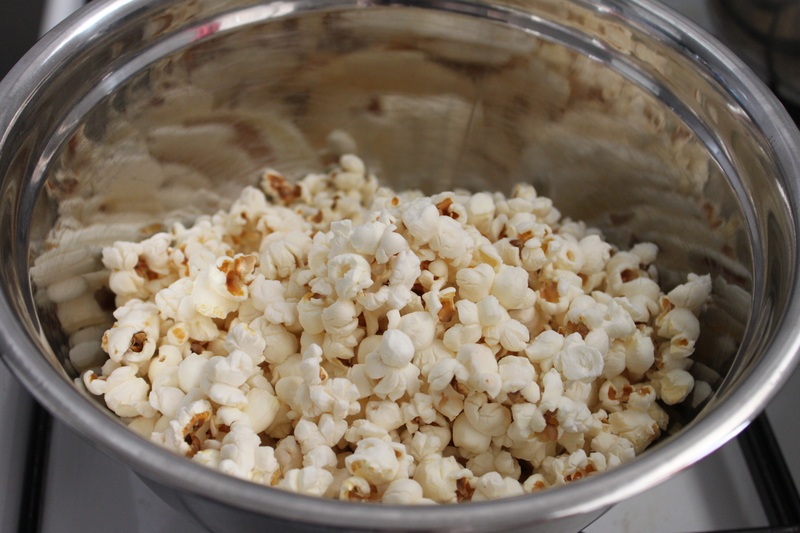 Pour half the popcorn into a large bowl (carefully, because it is very hot) and sprinkle on salt to your liking. Add the second half, and sprinkle on some more salt (I like to use less salt than is “enough” for my taste on the first half and salt it exactly to my liking on the second half, because the popcorn tends to get saltier as you get closer to the bottom of the bowl and that is because the salt from the top trickles down to the bottom). This is my recipe for standard, classic popcorn. It is the one I keep coming back to again and again, and is the base for all the possible variations on it. Right after adding the cup of kernels to the pot, add 2-3 tablespoons of sugar and shake well. Lower the amount of salt and sprinkle on some nutritional yeast. Lower the amount of salt and sprinkle on a combination of turmeric and paprika. This is more of a great dip for the popcorn. 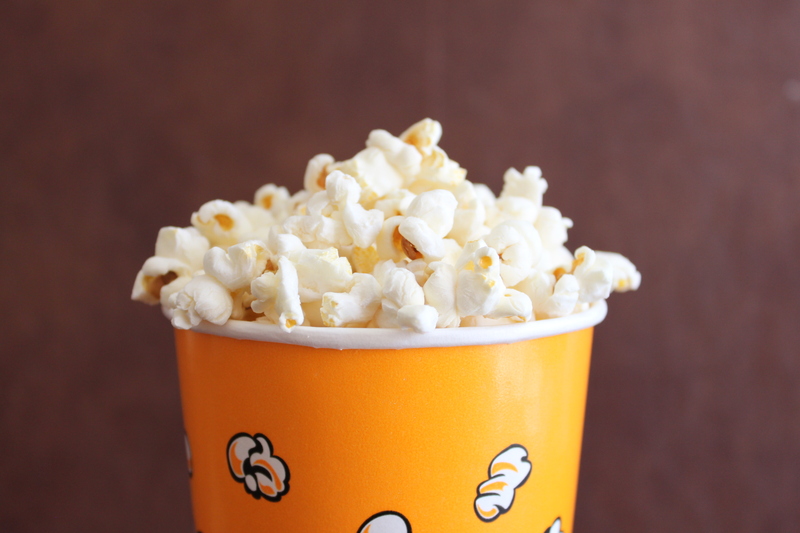 It is sweet and creamy, which goes oh-so-well with the salty crunch of the popcorn. Stir together 1/4 cup raw tahini with 2 Tablespoons honey (or date-honey). Dip popcorn in tahini mix. Consume. Feel heaven on earth. There are so many ways to be creative with this! Choose a large, flat-bottom pot (preferably not non-stick). Cover the bottom of the pot with a thin layer of canola / vegetable oil and put three kernels on it. Heat over medium-low heat until all three have popped. 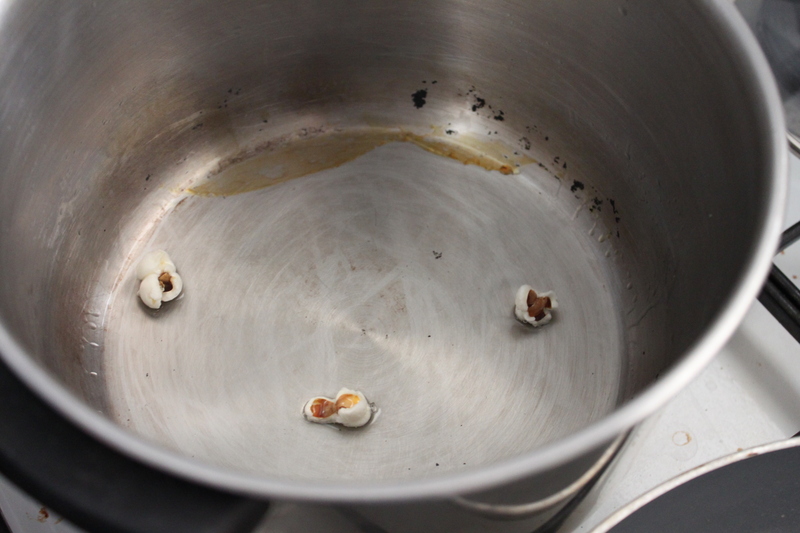 Once all three kernels have popped, add 1 cup minus 2 Tbs kernels and shake until they become covered in oil. (If making kettle-corn, add 2-3 Tbs sugar now). 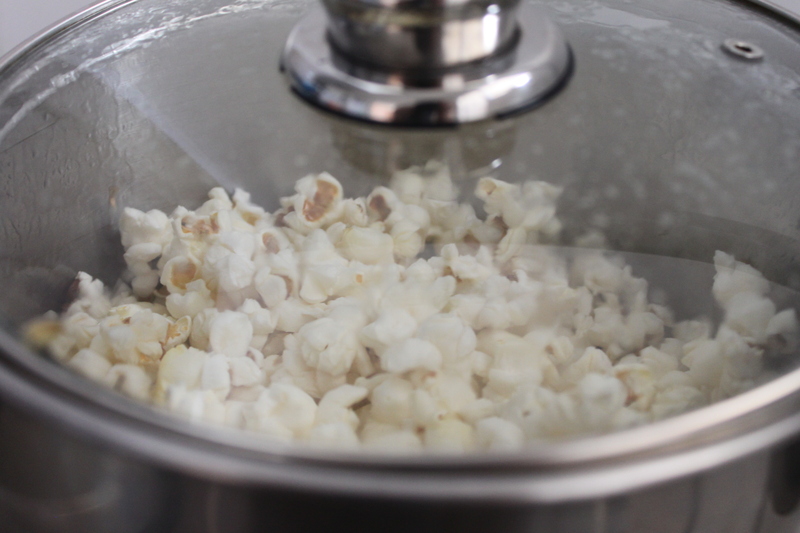 Cover pot loosely and let pop until pauses between each pop are 3 seconds long, shaking the pot (swirling the popcorn in it) once or twice throughout the process. Remove immediately into a large bowl, spice as desired and serve hot. This entry was posted in Appetizers & Snacks and tagged DIY, gluten-free, healthy, homemade, non-dairy, quick & easy, vegan by Adi. Bookmark the permalink. תודה :) למרות שנראה לי שברמה הזו זה כבר בגדר הפרעה ;) סתם צוחקת! יאללה אני לומדת מהבית היום אז זזה להכין איזה קערה. או שתיים.